Luigi Veronesi was an Italian photographer, painter, scenographer and film director born in Milan. He started his artistic activity in the 1920s by training as textile designer and by practising photography. He was introduced by Raffaelle Giolli in a group of Italian intellectuals associated with the review Poligono. At the age of 20, he was interested for painting and took lessons with the Neapolitan painter Carmelo Violante, then professor at the Accademia Carrara of Bergamo (Italy). In 1932 he travelled to Paris and met Fernand Léger. His first works were presented in the Gallery Il Milione in Milan. They were still figurative. Later, Veronesi started to research in the direction of abstract art. In 1934, he exhibits xylographic works with the German artist Josef Albers in the Gallery Il Milione. In the same year he joined the photographic group Abstraction-Création in Paris, he experimented constructivism, and adhered to the Bauhaus method. 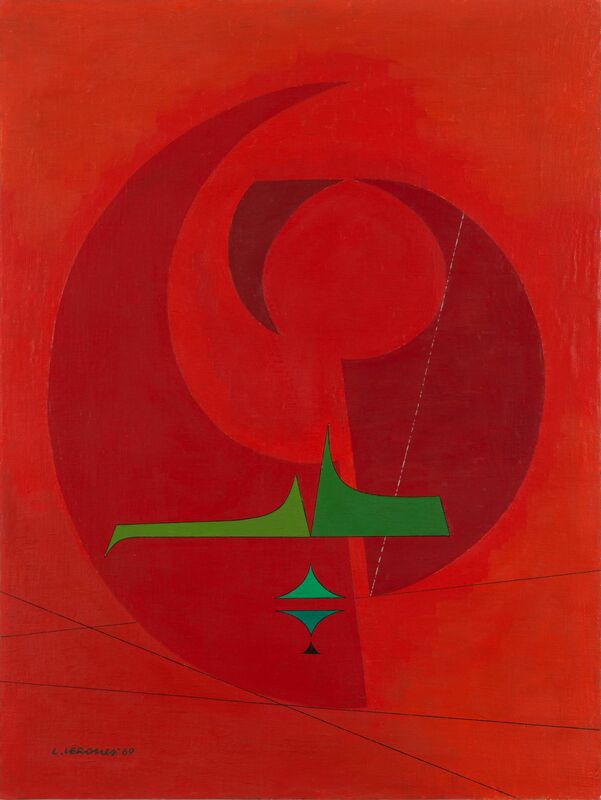 On 4 March 1935, he participated to the first collective exhibition of abstract art of Italy in the atelier of the painters Felice Casorati and Enrico Paolucci in Turin together with the artists Oreste Bogliardi, Cristoforo De Amicis, Ezio D'Errico, Lucio Fontana, Virginio Ghiringhelli, Osvaldo Licini, Fausto Melotti, Mauro Reggiani and Atanasio Soldati, who signed the Manifest of the first collective exhibition of Italian abstract art. In 1936, Veronesi was the illustrator of a geometry book of Leonardo Sinisgalli and he participated to the triennal of Milan. In that year he also participated to an exhibition of abstract art in the city of Como (Italy) with the artists Lucio Fontana, Virginio Ghiringhelli, Osvaldo Licini, Alberto Magnelli, Fausto Melotti, Enrico Prampolini, Mario Radice, Mauro Reggiani, Manlio Rho and Atanasio Soldati. In 1939 he made a personal exhibition in the Gallerie L'Equipe in Paris. Veronesi was also active in theatre and cinema with nine experimental and abstract films made between 1938 and 1980, seven of which were destroyed during bombing in World War II. He participated to the national exhibition of scenography in Rome in 1938. In 1942, he made the scenography of the opera Minnie la candida of Riccardo Malipiero. From the 1940s, he worked as scenographer with Giorgio Strehler, the founder of the Piccolo Teatro of Milan, in particular in works of Luigi Pirandello, and later built several sets for the Scala Theater of Milan until the end of the 1980s. After World War II, he was the co-founder of the photographic group La Bussola. He participated to the exhibition Arte astratta arte concreta in the Royal Palace of Milan (Palazzo Reale) in 1947 and adhered to the Movimento Arte Concreta (M.A.C.) in Milan in 1949. He worked several years as graphic designer. From 1963 to 1979, he taught graphic arts at the graduate course of industrial design in Venice and later was professor of colour science at the Brera Academy (Milan). In the 1980s, he participated in the exhibition on Italian abstract art in the framework of the 33rd Biennale di Venezia; he made a personal exhibition in Bolzano in 1980 and another in Pordenone (Italy) in 1984; and he was the coauthor, with Giancarlo Pauletto, of a book on the Italian artist Genesio De Gottardo published in 1989. Luigi Veronesi was a polyvalent and eclectic artist who managed to synthesise the avant-garde movements of various regions of Europe. He died in Milan in 1998.